What Did Brian “Don’t Call Me a Media Critic” Stelter Mean By That? LELAND VITTERT: The question I think, really, is the buzz is actually a good thing this early on. We’re still a long way until Iowa, long way until New Hampshire. Or is the sound of the buzz a chainsaw? 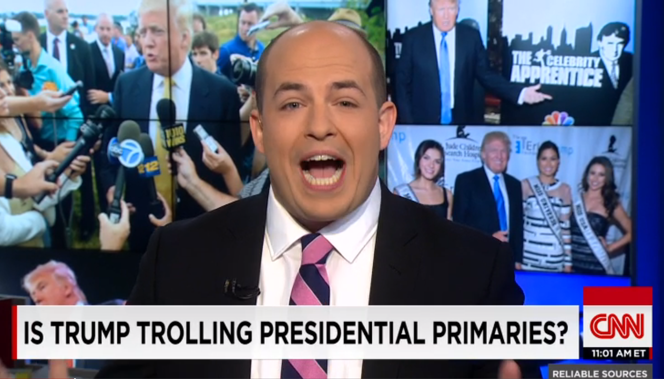 STELTER: I don’t know — I don’t think FOX knows how to cover this campaign. I never want to demean anyone. I don’t view myself as a critic though; my title is media correspondent. I stopped reading when I saw it said “media critic,” which is not my title. my job title is “senior media correspondent.” previously, at the NYT, i was a “TV reporter.” not critic. Brian Stelter aside, since I don’t know what his real role is either — the division at Fox News among hosts and guests is interesting to follow. Which belies the myth that they all march in lockstep to directives from Rogerr Ailes.